Andrew Fisher (left) has been studying the interactions between surface water and ground water in the Pajaro Valley for ten years. When a community forum was held in Watsonville on November 1 to discuss the future of the Pajaro Valley's water supply, organizers needed experts to describe the state of the region's ground water. They turned to Andrew Fisher, professor of Earth and planetary sciences at the University of California, Santa Cruz. A hydrogeologist, Fisher studies the interactions between surface water and ground water, and over the past decade his research has focused on the Pajaro Valley. Recently, for example, he investigated how Corralitos Creek and the Pajaro River contribute to the recharge of the region's underground reservoir, or aquifer. The Pajaro Valley aquifer provides more than 90 percent of the water used by the area's residents, businesses, and farmers. Fisher reported to the community forum that this crucial water supply is in grave danger of running out. "Water levels in the aquifer have been plummeting for the past 20 to 30 years," he said. "Even worse, during wet years the water levels have not come back." The withdrawal of water from an aquifer faster than it's replaced results in "overdraft." Just as overdraft of an important bank account can cause damage to a business, overdraft of an aquifer can irreversibly harm the environment. One consequence can be subsidence or sinking of the land. Near the coast, seawater can move into the aquifer--a growing problem in parts of the Pajaro Valley. "Parts of this aquifer may never recover in our lifetimes," Fisher noted. How did the situation get so dire? In recent decades, demand for water increased dramatically as the Pajaro Valley's agricultural industry and population both grew. Currently, people are pumping about three times more ground water than they should, according to the latest studies. Many people mistakenly believe they can take and use all the water that's available. "You can't capture all of it," Fisher said. "The amount you can safely pump before you get overdraft is much less than that." Also, certain locations are worse than others for tapping into the aquifer. "If you pump near the coast, that will have a greater impact immediately on seawater intrusion," Fisher said. "But the basin is one entity and the problem is occurring because of decades of pumping all over the basin." The overdraft problem was acknowledged in 1994, when the Pajaro Valley Water Management Agency (PVWMA) adopted a Basin Management Plan. The plan was revised in 2002. More recently, the County of Santa Cruz has been considering a declaration of a groundwater emergency and a freeze on permits for new wells. Due to political conflict and lack of funds, however, the PVWMA has been unable to take much action to preserve the aquifer, according to Fisher. Since 1997, he has served as a technical advisor on several PVWMA committees that examined ground water conditions in the basin. "You can think of the overdraft as a giant hole in the aquifer that needs to be refilled," Fisher explained. "If we commit to this tomorrow, it will still take decades for this basin to recover." Fisher has been invited to comment on the overdraft situation at the next meeting of the Santa Cruz County Board of Supervisors on Tuesday, November 20. Research by Fisher's group and colleagues has determined that seepage from Corralitos Creek and the Pajaro River may contribute as much as 40 percent of the annual recharge to the aquifer. However, parts of these rivers tend to run dry during the summer. When rainfall returns, the soil surrounding the riverbeds must reabsorb water in order to reestablish flow to the aquifer. "When these rivers go dry it's a lost opportunity," Fisher suggested. "If it were possible to keep these rivers running the entire year, the basin might get more recharge." Fisher's research team has begun studies of the PVWMA's Harkins Slough Recharge Project to investigate how well it's performing and whether it's possible at that site to further increase the flow of surface water to the aquifer. 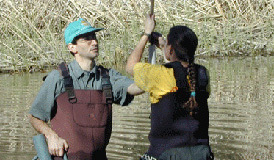 The team uses physical and chemical techniques to track ground-water recharge and plans to build computer models of how water flows through the area. The PVWMA will need to do a lot of monitoring and "adaptive management," adjusting their projects and plans as new information comes in, according to Fisher. Aquifer recharge rates might be reduced by climate change in the coming decades. Most regional climate models predict that in the coming decades the region will receive more intense rainfall during shorter periods, which would lead to more runoff to the ocean and less percolation into the ground. Higher temperatures are also expected to increase the evaporation of water into the atmosphere. "Water is constantly in motion and the two parts of the hydrological cycle that are hardest to measure are evapotranspiration and ground-water recharge," Fisher said. Still, a more accurate and detailed computer model of the Pajaro Valley's hydrogeology is on the way. Fisher is serving on an advisory committee overseeing a new, regional ground-water model being developed by scientists at the U.S. Geological Survey. Due out in early 2008, the model is expected to provide a powerful tool for the PVWMA and the public to use in monitoring and evaluating water resource projects. And it could be updated to account for changes in rainfall patterns and in local land use. "There are no easy answers, and no good guys and bad guys," said Fisher. "It's such a big problem, everyone is going to have to contribute to a solution." A range of options is being considered, because no single action can solve the problem. Increasing water conservation and recycling are obvious solutions with widespread support. More controversial is the proposal to import water from the Central Valley. The PVWMA determined that the local water supply would not be enough to meet future demand and that shortages would likely cause severe disruptions to the economy. The agency has an allocation of water from the California Aquaduct that it could legally tap into. To do this, however, would require costly investment in infrastructure, such as pipelines. And these pipelines might simply link the Pajaro Valley to other thirsty parts of the state, where people are also worried about future water supplies. "The reality is that many of California's aquifers are now in overdraft; it's a huge problem statewide," said Fisher. The community forum, sponsored by the PVWMA, will continue on Thursday, December 6 at 7 p.m. at the Watsonville Women's Club located at 12 Brennan Street. An agenda and list of speakers are available on the PVWMA web site. Note to reporters: You may contact Fisher at (831) 459-5598 or afisher@es.ucsc.edu.